I have never constructed a drawer from with a bottom that is glued into slots on the sides created using a router. The last workshop bench that I built was in Portland, and I just nailed a box together and put in on a shelf below the bench. It did not have slides and when it was full of tools it was hard to open. This work bench is going to have drawers with metal ball bearing slides rated for 100 pounds. 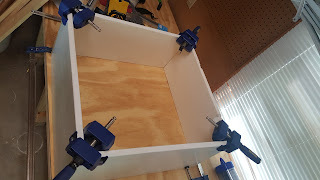 I will also construct some boxes with caster wheels to slide under the bench. 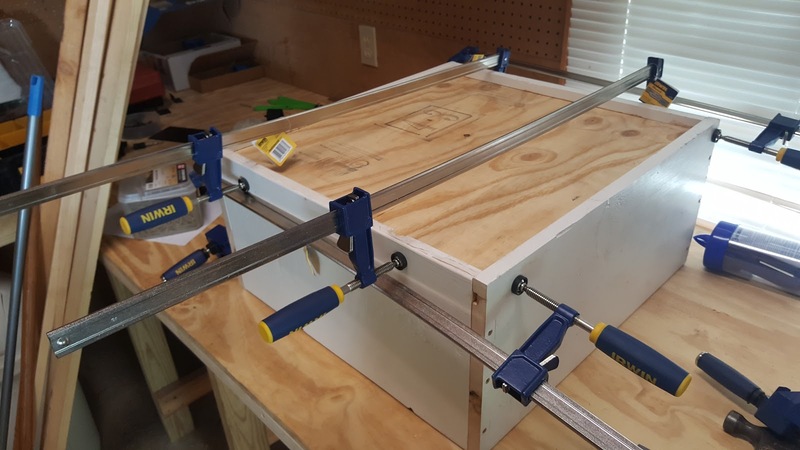 I got the inspiration for this workbench from April Wilkerson. I have always wanted to have a good set of woodworking tools. I am gradually buying the tools that I need as I build this work bench. 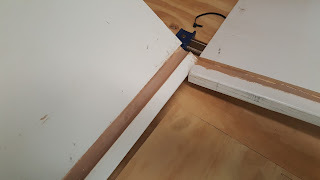 The skills and the tools that I acquire from building the drawers for my workbench will be used to build drawers in the kitchen pantry. The kitchen pantry has a bunch of shelves with do not allow for efficient organization of items. There is also a lot of wasted space, so by adding drawers more items can be put in the pantry. 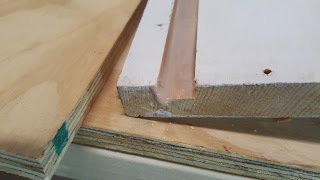 Here are the pictures of the drawer build. I am using wood salvaged from the house to build these drawers. and other square objects so these clamps will get a lot of use. I bought 4 36 inch bar clamps. I use to have a set of 48 inch pipe clams, but they got left in Portland, OR. These are the first of many clamps that I will acquire for my projects. I just got my first nail gun, but I decided to just use deck screws to attach the sides. The entire bench is assembled using deck screws. This is the first use of wood glue on this project.